Adding my new heart pig just because her main symptom was somewhat misleading, and if someone else also has a silent pig I'd like the info to be there for them. 1 - Radish a mix with some Abyssinian and possibly teddy; she's got two defined rosettes but her whiskers and hair crinkle a bit. Unknown age, anywhere between six months to a year and a half. She's unfortunately very runty although she's full grown, which makes it difficult to tell. 2 - She started out incapable of most voluntary vocalizations. I could get startled squeaks out of her occasionally and a (often wheezy) purr if I scratched her chin, but she couldn't wheek or burble-- she'd just sort of click. However, occasionally she would make congested noises reminiscent of someone trying to clear their throat/breathe through phlegm. Baytril did nothing for her lungs, and after that my initial vet said her lungs and heart sounded fine, so it was likely just a quirk. She also was extremely underweight even for her size (hovering around 530-550) and would not put on weight no matter what I did, despite her good appetite. 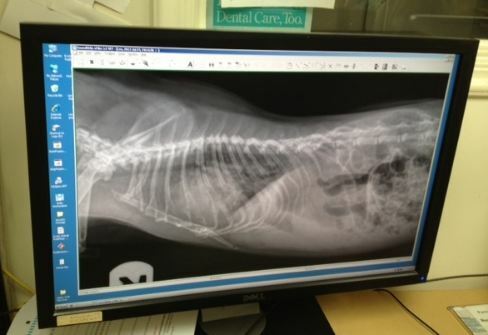 3 - She had an x-ray done (which I can upload) while at a different vet for what turned out to be bloat. The size and shape of her heart confirmed it, as did how she responded to treatment. 4 - She's currently on .08 of Furosemide twice a day. 6 - She's currently going balding on her lower belly. Some of it is her barbering the hair short, but her skin is also flaky. My first vet gave her Revolution, and the vet I went to when she bloated gave her ivermectin as it had been two weeks and she hadn't improved. I encourage you to start a thread on your guinea pig and post more there. This thread is not for discussion and I have some suggestions. Buddy, a heart pig, breathes noisily to the degree I keep yelling at him to "cough it out" which he does eventually. He's on Lasix as well. Other heart pigs have sounded like trains with their breathing so yes, vocalization could be another indication of heart issues. Just adding my girl, Pearl, who is really struggling with her heart right now. 3 - Suspected URI that did not respond to antibiotics. Looked at symptoms and had advice from experienced pig rescue that it may be a heart problem. 5 - Pearl did well for one year+ on a half tablet daily of fortekor. Offered a quarter of a tablet of furosemide when there was slight hooting which worked until now. She is now in half a tab of fortekor and half a tab of furosemide and struggling to recover. 6 - Always been slightly overweight, big framed girl, occasionally spur on her front two feet but no other health problems. I have been working almost exclusively with heart pigs for the past 12 years, since getting Issac, my first heart pig. Because I have had so many heart pigs and done the necropsys myself, which validated my information, I decided to write it up for others to read. I am currently giving talks at Peirce College here in California to the veterinarian tech. classes, as well as the local exotic vets. and rescues. The vet will listen to the heart with a stethoscope and note any abnormal sounds like arrhythmia or murmurs. He/she will observe respiratory rate and examine the mucous membranes. Pale or cyanotic membranes may indicate poor blood circulation. Note: Most enlarged hearts sound normal. Some animals also have a heart murmur which can be heard. Diagnostics can help identify cardiac diseases and assess heart function and condition. Note: enlarged hearts may not show up on x-ray or ultrasound. We usually treat by symptoms and only do x-rays for diagnosis if needed to verify it. Myocarditis from scurvy will not show up on x-ray. Also, Pericarditis (an inflamation of the sac-like covering around the heart) does not show up on x-ray. You must have am ultra sound to diagnose it. X-rays: Radiographs show the thoracic cavity, relative size of the heart, and the presence of fluid in the lungs. They can help the vet distinguish between Congestive Heart Failure and respiratory disease. However, many heart pigs have respiratory disease including pneumonia., due to the poor functioning of the heart. Signs: These signs may occur daily or only occasionally. If a Guinea pig exhibits any of these signs, seek veterinary care immediately. Only see a vet familiar with heart disease in Guinea pigs. Labored breathing can indicate Pericarditis as welll as CHF. &#61599; May produce a "hooting" sound (sounds like a dove or owl). The heart is pressing on the trachea. Scurvy has been found to be a significant factor in causing CHF, as well as many other illnesses and conditions like arthritis, in Guinea pigs and humans. Supplemental vitamin C is absolutely necessary with a minimum of 50mg daily for a healthy pig. 1cc per day of Child Life baby liquid C, or 1 tablet of Oxbow vitamin C tablet per pig daily. Double the amount if the animal is ill. The liquid is preferred in this situation to be sure they get the correct amount if not eating well or they won’t eat the tablets. Do not just grind up and sprinkle the tablets. You have to know how much each pig is getting and you don’t this way.. It only takes 30 to 60 days without adequate vitamin C for a human to begin to develop scurvy. The same time frame is true for other primates and Guinea pigs to develop scurvy. They can not get enough in veggies or pellets because there is no way to determine exactly how much they actually process, how much is in a given vegetable or how many pellets they eat each day. You can not overdose vitamin C in the dosages recommended. It is water soluble and any excess will be excreted in the urine. The effects of scurvy can not be reversed, but they can be slowed down and sometimes stopped once vitamin C is administered. Benazepril (Lotensin®), an ACE inhibitor used to treat heart failure. Compounded 2mg/ml. .5cc twice a day no matter what the pig weighs, is the standard dosage. We have found that Enalapril is not as effective with Guinea pigs. If the heart appears to become normal or near normal size, continue at the same dosage. Do not decrease the dosage because the heart tends to become enlarged again. Furosemide (Lasix®) a diuretic used to treat pericardial effusion and/or pulmonary edema. 10mg/ml compounded. .3cc – 2-3 times a day when animal is in distress with fluid on the lungs. After stabilized, .3cc at night only. This can be used as needed and many pigs are on it their entire lives, depending on the severity of their symptoms. Vetmedin 1.25mg is used when there is a heart murmur present. 1/4 tablet twice a day, crushed and mixed with 1cc water is the standard dosage. It can also be used with animals in severe heart distress. Baytril and Azithromycin are used for URI symptoms. Many Guinea pigs recover faster with the addition of antibiotics in case they also have underlying infections like pneumonia. Signs of scurvy that are similar to those for heart disease. Thanks so much for adding your advice! Perhaps I should add some of it to the heart page? (there is some overlap but a few new points would be helpful) I don't think my cardiovascular meds are as detailed. Perhaps I should add yours there? http://www.guinealynx.info/cardiovascular_agents.html Do you have references for any of the doses so people can show the sources to their vet? I would appreciate you posting the information where you feel it would help. Actually the dosages are from the heart information posted on GL, especially by Mum. It's interesting that Lotensin is one of those drugs you can give the same dosage no matter the size of the pig. It doesn't seem to go by the weight of the animal, probably because a heart is a heart, if that makes sense. I have xrays of a pig that the heart actually became smaller with the Lotensin, which some of them do. The vet lowered the dosage to .3cc twice a day and 6 months later the pig was in heart failure and the heart was larger than it was when originally diagnosed. Now the pig is on the .5cc twice a day and Vetmedin plus Lasix as needed. I have had pigs on up to .75mm Fortekor twice daily who only weighed in the kilo range. And I have had a very large pig on the higher dose. Fortekor seems to have a very wide swing when it comes to dosages. Right now the pig on .75mm fortekor is 1 3/4 pound. He was 3lb 6 oz at his prime and receiving the .75mm dose. We just kept him on the same dose. Heart is very very bad right now. He's also on a daily dose of Lasix 1 1/2 times the max dose (for a 1lkg pig). Important note: When poor circulation due to a bad heart causes necrosis of the ears(edges die off) it appears in pigs with pink ears as black on the edges of the ear. On pigs with black ears, the necrosis appears as white on the edges of the ears. Buddy, our black pig has heart issues. His black ears turned white on the edges. Then the edges started to fall off. Necrosis was confirmed by my vet and his Fortekor was upped from 0.5cc(2mg/ml) twice a day to 0.75cc twice a day. The white on the edges of his ears disappeared and his ears are back to black although a bit motheaten around the edges. He is also on Vetmedin and Lasix. He has been on .13ml of 5mg compounded Lotensin and .5ml of Lasix twice a day for three and a half weeks and I noticed his sides pulling in again so we went back to LBAH and saw Dr Ridgeway this time. His respiration was 130 and I can't remember what his heart rate was but it was "normal". Ridgeway increased the Lotensin to .25ml of 5 mg compounded Lotensin 2x a day and .63ml of Lasix 2x a day. Other that the obvious trouble breathing the only other sign I've noticed is he'll cough when he gets agitated. He is the sweetest pig. I absolutely love him. I think I'm going to get to be his sanctuary foster home and I'm very happy. Even though it means taking days off from work to drive an hour and a half each way to see the vet frequently, its worth it cause he's awesome! I have some heart pig meds if anyone needs them. I have Lasix (Furosemide) and Vetmedin. They are new. My heart pig had a heart tap surgery 2.5 years ago and went on these meds. But he passed in November. I decided to wait to post here until I knew how this story ended. Odette (birthday early July 2009), on January 15, 2014 while being treated for a bladder stone the vet noticed her heart seemed enlarged. She had no symptoms. On January 28, 2014 a cardiologist after performing an ECHO determined her heart was enlarged and she had fluid around her heart. She was prescribed .25 mL Benazapril and .25 mL Furosemide. On February 10, 2014 Odette returned to the cardiologist for a follow up. Her heart had not changed, and so they added .14 mL of Vetmedin. She was still not showing symptoms consistent with a heart problem. On May 1, 2014 Odette returned to the vet. They noticed labored breathing, and heard noises in her lungs that they believed indicated her lungs had fluid in them. They upped the Furosemide to .4 mL. I had never noticed her breathing being labored, but after this visit her breathing was labored on and off. On May 14, 2014 Odette started out the day fine, but by evening was behaving lethargic. On May 15, 2014 Odette became limp in the morning, and I could hear a slight clicking noise when she would breathe. After being rushed to the vet it was determined she was slightly dehydrated as a result of the Furosemide. However, she began having seizures and passed away of unknown causes at 10:00 pm. I need access to the heart xrays but Photobucket isn't allowing access for me, are they available anywhere else? Thanks. Perfect! Thanks, Jaycey. There's a whole new chapter on Barley appearing soon. He and his brother Horlicks appear to have abnormalities we are trying to get to the root of. Oh no! Hope they're okay. I really need to catch up on my chronicles page, poor Podrick hasn't even arrived on it yet. Is it useful for me to describe Cookie's stuff here, given that we didn't do an x-ray to confirm her diagnosis? Yes, if you saw treatment results consistent with heart issues. Ditto Lynx. Yes, especially since a definitive diagnosis is often hard to come by, and we so often go on clinical sign and treatment response results. Sounds like there are no results yet (I read her thread).